It doesn’t matter if your betting software is for online or land-based operators, it can’t be considered complete without the Virtual Games module. Virtual games are created by Artificial Intelligence and 3D animations with the feature to let your players enjoy the live experience of every challenge or bet, again and again. 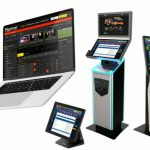 from your betting shop, buying tickets and watching virtual games and races on TV or monitors, thanks to the possibility to install our Box and connect all your betting points with one click. Land-based and online betting platforms can now walk side-by-side. Motorcycles races, the player bets on its favourite biker among six opponents. The range of virtual games is so wide that every 5 minutes there is a new event. Virtual games have achieved resounding success recently, proven by the fact virtual football – with all its tournaments – is one of the most requested solutions in the market. Don’t miss the chance to offer your players a complete land-based or online sports betting software, without waiving the user-friendliness and customisation characterising all Sirplay’s products.